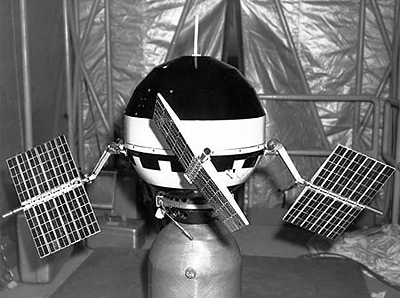 Pioneer 5 was a spin-stabilized space probe used to investigate interplanetary space between the orbits of earth and Venus. Pioneer 5 was originally intended as an Venus fly-by probe, but due to delays in the program, it was launched into a heliocentric orbit. The spacecraft measured magnetic field phenomena, solar flare particles, and ionization in the interplanetary region. The digital data were transmitted at 1, 8, and 64 bps, depending on the distance of the spacecraft from the earth and the size of the receiving antenna. A triple coincidence omnidirectional proportional counter telescope to detect solar particles and observe terrestrial trapped radiation. It could detect photons with E > 75 MeV and electrons with E > 13 MeV. A rotating search coil magnetometer to measure the magnetic field in the distant field of the Earth, near the geomagnetic boundary, and in interplanetary space. It was capable of measuring fields from 1 microgauss to 12 milligauss. It consisted of a single search coil that was mounted on the spacecraft in such a way that is measured the magnetic field perpendicular to the spin axis of the spacecraft. It could output its measurements in both an analog and a digital format. A Neher-type integrating ionization chamber and an Anton 302 Geiger-Müller tube (which functioned as a cosmic ray detector) to measure cosmic radiation. It was mounted normal to the spin axis of the spacecraft. A micrometeorite momentum spectrometer (or micrometeorite detector) that consisted of two diaphragm and microphone combinations. It was used to measure the amount of meteoritic dust particles and the momentum of these particles. Weight limitations on the solar cells prevented continuous operation of the telemetry transmitters. About four operations of 25-min duration were scheduled per day with occasional increases during times of special interest. A total of 138.9 h of operation was completed, and over 3 million binary bits of data were received. The major portion of the data was received at the Manchester and Hawaii tracking stations because their antennas provided grid reception. Pioneer 5 performed normally until 30 April 1960, after which telemetry transmission became too infrequent for any significant addition to the data. The spacecraft established a communications link with the earth from a record distance of 22.5 million miles on 26 June 1960, which was the last day of transmission.